Ever since the world caught its first glimpse of Kate Middleton, now Catherine Duchess of Cambridge, sporting the same sapphire engagement ring worn by Princess Diana, the endless comparisons between the two have not stopped. It's only natural that the young woman who married Diana's son would be compared to her. In choosing to give her his mother's ring, I suspect that William tried to somewhat preempt all Di vs. Kate comparisons by getting out in front of it and acknowledging that while his beautiful, stylish young wife is not Diana 2.0, she is her natural successor in the eyes of the public and, if truth be told, in the eyes of the royal family as well. Aside from the obvious similarities -- the photogenic looks, savvy fashion sense and naturalness with people -- there are substantial differences between the two women, the most significant being that while Diana was expected to fend for herself and learn the royal ropes simply by being thrown in the deep end, Catherine has been the recipient of boundless guidance and support from her husband and the rest of his family. No matter how hard the British royal family may try to take the best of what Diana brought to their orbit, impress those experiences upon Catherine and sigh with relief that she doesn't bring the same emotional baggage to Kensington Palace that Diana did, they can't escape the spectre of Diana. The public simply won't allow it. It is a credit to Catherine that her wedding in all its splendor was uniquely her own. She was so dazzling and regal (more than any other royal, it's worth noting) that there was no one or nothing that overshadowed her on that day. That is why it seems a bit odd that it is now, seeing her adapting to her new life as a royal that Diana's ghost seems to hover around her at every turn. I'm not talking about Tina Brown's ghoulish Newsweek cover either. By the way, why on Earth was Diana made to look so wizened? I'd bet the farm that Diana would have looked a hell of a lot better than was imagined in that photo composite. When Catherine and William stepped out for the BAFTA gala, I gasped when I saw the duchess get out of the car in a dress that was virtually identical (except for its lavender color) to the dress Diana wore at Cannes. Since Catherine was given a primer on how Diana handled the media and red carpet appearances you have to wonder if her choice of this stunning Alexander McQueen dress was meant to be a silent homage to Diana or is it that she has been so influenced by her late mother in law that she subconsciously picked the style without realizing the connection. While the breathless comparisons between Diana and Catherine's style are a fun fluffy diversion, the growing whispers -- and prevalence of tabloid stories -- about another thing the two women may share is something else indeed. With Catherine's rapidly shrinking frame, Princess Diana's much chronicled battle with eating disorders have been brought back into the forefront. This picture of Catherine and Nicole Kidman, one of Hollywood's slimmest actresses, at the BAFTA gala is simply shocking (and is sure to horrify the Oscar winner). It's clear that Catherine has lost considerable weight since her wedding. According to one tabloid, experts put her weight at below 100 pounds which is clearly unhealthy for a young woman of her height (5'10"). It was widely reported that Catherine (and her mother) were both on the Dukan diet (basically the French version of the Atkins diet) in the months leading up to the wedding. But now it appears that the new bride is veering dangerously close to the same unhealthy territory that plagued Diana when she first joined 'The Firm.' While it's true that Catherine is older and more sophisticated than Diana was when she first had to adapt to life as a royal, the pressure she is facing is just as intense. In some ways, one could argue, it's almost worse. Unlike Diana, Catherine has a lot to live up to. 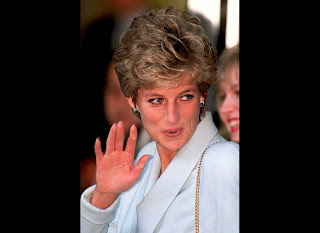 Diana forged her own path as the first superstar of the royal family of the media age. Until she came on the scene, there was no British royal that transfixed the world the way Diana did. The Windsors have learned valuable lessons from Diana and more significantly from the public reaction to her death. In order to remain relevant in this post-recession, Internet age, the British royal family knows they need a compliant superstar that will dazzle the public and tow the party line in private. Catherine fits the bill perfectly. She has dutifully gone out and done the walkabouts that were required of her chatting with regular folks and pulled off her first official visit with her husband to Canada and California beautifully. It's been reported that William and Catherine are pulling back a bit for the rest of the year to enjoy being newlyweds (the rest of the unwritten sentence goes something like this -- and so as not to overshadow the Queen). And, of course, there's Prince Charles who has been all but forgotten in the mix which can't possibly sit well with him. Catherine is said to have grown close to Camilla and looks to her as an advisor on royal life. Call me cynical, but I wouldn't want to have to navigate my way around that snake pit. (Camilla selflessly volunteered to show Diana around when she became engaged to Charles). I'm willing to bet that things could get pretty tense once William and Kate have their first child. There is no way in the world there will be any oxygen left for any other royal in the mind of the public when that happens. Of course, there is a great deal of affection for Queen and there always will be, but as far as the public is concerned there is Catherine and William and Harry (and his future bride). No one else matters. So perhaps Catherine's dramatic weight loss is the first indication of just how much pressure the newlywed is feeling as she adapts to a life so far removed from anything she had ever known. She is clearly a very strong young woman who has not yet faltered in the public eye. She is not 'the new Diana,' but yet she must feel the pressure to live up to a woman who in death has only grown in stature. A tall order to be sure. This has to be worrisome for William because saw first-hand how much his mother's battles with low self-esteem cost her. I'm certain he won't let the same thing happen to his new wife.